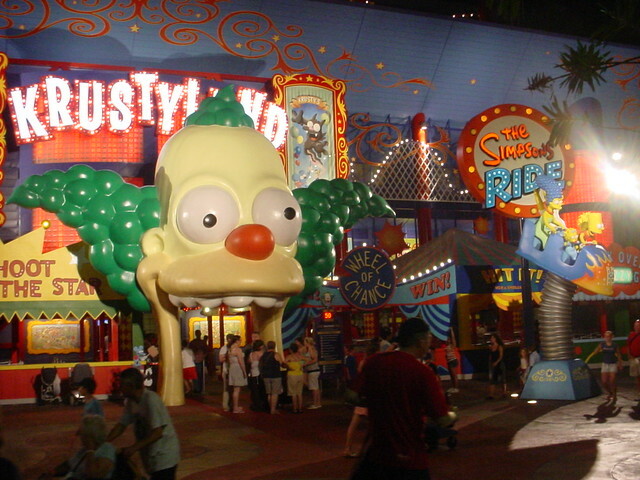 The Simpsons ride takes guests on a tour of the lastest attraction at Krustyland, the Krustiest Place on Earth. Guests board vehicles that travel all over Krustyland, taking in attractions such as the rollercoaster, The Happy Little Elves in Panda land, Captain Dinosaur's Pirate Rip-Off, and Krusty's Wet and Smokey water stunt show. A slow moving line first on the outside of a building that may require a steep climb to the top of the building depending on where each guest is seated. There are a few television monitors that show clips from the Simpsons, mostly relating to theme parks, as well as some new animation, including one scene that reveals how Krustyland took over the Institute of Future Technology (which was what the building the attraction is housed in was referred to when this location was Back to the Future.. The Ride). After the outdoor portion of the queue there are two smaller waiting areas, each with its own part of the preshow.